Pan Tadeusz is mostly (mostly) not an obviously patriotic poem. One character claims that Polish coffee is the best, and at another point Mickiewicz tells us that Polish frogs sing the sweetest. Highly questionable sentiments. At some point, though, the political undercurrent of the poem becomes clear. The story is set in the spring of 1812. Napoleon has appeared on the Polish border. French victory against Russia means, perhaps, freedom for Poland. The local story of the poem intersects with history. The last canto of Pan Tadeusz (titled “Let Us Love One Another!”) describes “the last banquet in the old Polish style.” It’s a marvel. The plot, as such, is finished. The last canto has another purpose. Its tail in a ragout with sauces hid. And all the dead of hallowed memory. And what I saw and heard all men may read. * Also, attending Goethe’s 80th birthday part and trying to seduce Margaret Fuller. Mickiewicz was an interesting fellow. Adam Mickiewicz's Pan Tadeusz (1834) is the Polish national epic. That has a dreary sound to it, somehow - conjures images of bored schoolchildren memorizing patriotic passages - even though The Song of Roland, The Poem of the Cid, The Niebelungenlied, the great medieval national epics, are wonderful poems. They wouldn't have the status they do if they were boring. Pan Tadeusz is hardly boring. It's set in the Grand Duchy of Lithuanaia (confusingly, in modern Belarus), amongst the Polish gentry. Young Master Tadeusz has just arrived from the university, to an estate that has not one but two lovely, marriageable ladies. The neighboring Count is his rival. Since it's a love quadrangle, the story ought to have a happy ending. One of the funniest scenes is during a bear hunt - Tadeusz and the Count both fire at the bear and miss, then both grab the same spear, then both run. These are not the usual epic heroics. A lot of the long poem concerns itself with vivid descriptions of more or less ordinary life - hunting, mushroom picking, banquets. But there's also a lawsuit, a mysterious monk, and a battle against the Russians. A lot going on, actually. Pan Tadeusz is sort of a combination of a Scott novel, Pushkin's Eugene Onegin, and Goethe's "domestic epic" Hermann and Dorothea. Holding a sieve uplifted in her hands. And spread their sharp-spurred feet in either side. Like fishes that above the waves appear. A thousand eyes like stars on Zosia flash. Every canto has something as good as the "rolling balls of wool" and the chicken-head lilies. I read a translation by Kenneth R. Mackenzie, published by the Polish Cultural Foundation in London. The Polish was included, allowing me to see that the original and translation are both in regular rhyming couplets. That's about it. Another complete tranlsation is available in a PDF here. A Voyage to Senegal in 1816 (1817) is not the account of just any voyage to Senegal – see left. It’s that voyage to Senegal. H. B. Henri Savigny and Alexandre Corréard are two of the fifteen (or eleven) survivors, out of 150, who were abandoned on a raft when the Medusa, bound for Senegal, foundered on a shoal off the coast of modern Mauritania. Géricault’s painting was based directly on this book. The book is, in part, a legal brief against the incompetence of the captain and the malfeasance of others. The five boats of the Medusa, some barely seaworthy themselves, were insufficient for the number of crew and passengers, so a large raft, twenty meters by seven, was constructed for the excess, mostly soldiers doomed, or anyway assigned, to colonial service. Savigny, a surgeon, and Corréard, a geographer, were among the non-soldiers. Despite the size of the raft, 150 people plus minimal supplies filled it enough that most people had little room to move. The other boats were supposed to tow the raft, but they had troubles of their own, and abandoned the raft almost immediately. This is not, mostly, an edifying story of heroism. Two things I had never understood. First, between the wave action and the raft’s poor buoyancy, most people on the raft were up to their knees, or waist, in seawater much of the time. The small raft in the painting is a platform that the survivors had built to keep themselves (barely) out of the water – the bulk of the raft was actually underwater. Second, almost all of the deaths were caused not by exposure, disease, or privation, but on the battlefield. On the second night adrift, the soldiers, mostly criminals forced into military service, many probably half-crazed by liquor, dehydration, and exhaustion, staged a mutiny. The battle for control of the raft raged for about two days. Fifteen people survived the battle. These fifteen then survived almost another two weeks on the raft, although four died soon after they were rescued. An alternative to Géricault’s horror, which does at least depict a moment of hope, is to picture a pitched battle with sabers and clubs (the gunpowder is all ruined), waist-deep in seawater, at night, during a storm. Much of A Voyage to Senegal is what they call a page-turner. One stylistic note: On the rare occasions when dialogue is reported, it is always in the form of a declamation, as if it were from a Racine play. “Believe me, Major, France can also boast of a great number of men, whose patriotism and humanity may rival those which are found so frequently in Great Britain. Like you we are formed to the sentiments, to the duties which compose” and on and on for another page or so (p. 243-4), all in the finest French classical style. This helps one appreciate the innovations of the French Romantics, the relative realism of Balzac and Stendhal, Alfred de Vigny and Hugo. That classical bombast gets old fast. Sheila Heti's Ticknor - Put the pie in the flower bed. William Hickling Prescott was an important 19th century historian (The Conquest of Peru, The Conquest of Mexico). George Ticknor, a childhood friend, was also a distinguished Bostonian man of letters. Ticknor was also Prescott’s biographer. Contemporary Canadian youngster Sheila Heti has used the lives of Prescott and Ticknor to structure her little slip of a novel, Ticknor (2005). It looks like it might be a historical novel, but Heti is just having her clever postmodern fun. The two most authentic historical scenes in the book are a detailed description of a hospital and a first-rate Christmas scene that are pinched directly from Florence Nightingale and others (see the Author’s Note). It’s that kind of book. Sorry, what’s that? A trip to Nigeria, you don’t say? For his daughter’s health, you don’t say? There might be some fun in separating fact from fiction here, but not much, I think. Forget the history – it’s just a hook on which to hang a novel about jealousy and betrayal. Self-perceived betrayal. The Prescott of the novel is wealthy, well-married, famous, and important. The Ticknor of the novel is none of these things. So there we have the jealousy. Prescott has known Ticknor since they were children, but has other, better friends and only sometimes invites Ticknor to his parties. There’s the betrayal – in other words, no betrayal at all, just ordinary life, and Ticknor knows it, which embitters him more. * This all seems acutely observed. Mark Sarvas of The Elegant Variation has championed this book. He has praised it for its evocative period details, for example of the Prescotts’ kitchen. This is a great testament to the power of the imagination, since the kitchen scene includes almost no concrete details whatsoever (at least of the kitchen - Prescott’s wife’s “wide” posterior “was like a whole other being entirely; a lovely creature stuck to her legs”, p. 32). I have seen other reviewers,** Sarvas, too, praise Ticknor’s voice for its authenticity, which I don’t hear at all. Ticknor’s voice is more like that of the narrator of The Good Soldier or Malone Dies than of Hawthorne or Emerson or Longfellow or Parkman. All to the good, too, since it’s consistent and without jarring archaicisms. It might sound like I’m knocking Sarvas here, which is not my intent. He actually pointed me toward this book, which is very much worth a look. Sarvas’s own novel (Harry, Revised) just came out. While doing some Ford Madox Ford-style page 90 tests in the bookstore last weekend, I picked up Sarvas’s book, and not only did he easily pass the test, but out of the dozen or so books I tried, he was only topped by Irène Némirovsky. I strongly recommend Ticknor, all 118 pages of it, to any reader who finds this funny: “She can vouch for my character. I have a pie” (p. 52), and later “I thought you said ten. Put the pie in the flower bed. Leave now.” (p. 54) I do, and there’s more like it. * And there’s a final shocking revelation, which I won’t go into, since it’s so oblique yet so obvious that I assume it’s a parody. ** This Village Voice review is in a class of its own: "Lately, this reader's been occupied with a dismal question. Do any of the books we adore leave us feeling they really, truly need to exist?" Time, perhaps, to take a break from book reviewing, then? I've complained before, and I'll complain again, about the poor presence of 19th century German-language literature in English. Reading Gotthelf and von Droste-Hülshoff provides another clue as to why this might be. Most of the first cohort of German Romantics were gone by the time Goethe died, age 82. Hoffmann was gone, Heinrich von Kleist, Novalis, Schiller. Hölderlin was still alive, but basically insane and unproductive. With the important exception of Heinrich Heine, almost every major German-language writer in the next generation or two was a sort of regionalist. Jeremias Gotthelf and Gottfried Keller in Switzerland, Annette von Droste-Hülshoff in Westphalia, Edouard Mörike in Swabia, Adalbert Stifter in Austria, Theodor Storm in Schleswig-Holstein. All of these writers wrote about where they were from, sometimes exclusively. I wonder if that makes them look minor to outsiders? Unambitious. It can't help that they all specialized in lyric poems, hard to translate, and/or novellas and tales, which have their own prestige problem, rather than big fat novels (excepting Keller's Green Henry and Stifter's two novels). Not so long ago, "regionalist" was almost a term of abuse in the United States, a way to dismiss a writer. This reader prefers small and perfect to ambitious and flawed, and in the right hands I'm as happy out in the provinces as in Paris or London or New York. But other readers seem only to want attempts at the Great German/ Russian/ American Novel. Penguin Classics has kept Mörike in print, so someone is reading, or teaching him. And I came across a rumor that NYRB is republishing Stifter's Rock Crystal next fall. So there's some good news. To NYRB: there's a lot more good stuff where that came from! Green Henry? The Black Spider? Das unheimliche – the uncanny - when something is not quite right. Weird and spooky. In the 19th century, the uncanny was a specialty of the German Romantics (Poe’s tales were sometimes dismissed as “too German”). Ludwig Tieck’s Blonde Eckbert or any number of E. T. A. Hoffmann stories are good examples. A story with some pretense to realism goes off track somehow. Dream-like elements intrude, or madness, or the supernatural. But whatever has gone wrong is hard to describe. Annette von Droste-Hülshoff’s novella The Jews’ Beech Tree: A Picture of Manners from Mountainous Westphalia (1843) is a brilliant, original tale of the uncanny, centered around an unsolved murder and its consequrnces. She’s careful to never quite violate ordinary realism. But strange things keep happening. “It had been the first night the boy had ever spent away from her, and still Frederick did not come. She was angry and anxious, yet knew that she had no grounds to be either. The clock in the church tower struck seven, and the cattle returned home; he was still not there, and she had to get up and look after her cows. When she returned to the dark kitchen Frederick was standing on the hearth; he was bending down and warming his hands at the flames. The firelight was playing on his features, giving them a repulsive look of emaciation and frightened twitching. Margaret stopped short in the doorway; her child looked so strangely altered. ‘Frederick, how is your uncle?’ The boy murmured a few unintelligible words, and pressed closer to the wall. ‘Frederick, have you lost your tongue? Child, say something, you know quite well that I don't hear well with the right ear.’ The child raised his voice and began to stammer so badly that Margaret could not understand anything. ‘What is that you say? A greeting from Master Semmler? Back again? Where? The cows are already home. Wretched boy, I can't understand you. Wait, let me see if you still have a tongue in your mouth!’ She moved a few steps nearer him. The child looked up at her with the sad eyes of a half-grown dog learning tricks, and in his terror began to stamp his feet and rub his back against the wall. Weirder and weirder, but we’re in a realistic world here. There’s nothing supernatural – Margreth’s son has not, it turns out, been replaced by a weird doppelganger. The strangeness is caused by the mother’s anxiety, not just about her son’s absence, but about his new adult status. The Jews’ Beech Tree is one of the most unstable stories I’ve ever read. No interpretation of events is entirely consistent. A ghost appears, or maybe it doesn’t. One character is the devil, or just a bad fellow. Actual, verifiable events often have some detail that suggests an alternative explanation. Somebody is guilty of something, but who, and what? This tale is the only one by Annette von Droste-Hülshoff, who is otherwise an important 19th century German poet (“most important female German-language etc.”). I read the Three Eerie Tales version this time, but look for anthologies titled German Romanticism and the like. And it’s here. It will never be a well-known story in English because the author’s name is too forbidding. Jeremias Gotthelf’s The Black Spider (1842) starts with a trick. Gotthelf was a Swiss pastor who wrote tales and novellas of peasant life, humorous or otherwise. The Black Spider, now his best-known tale, begins with a christening – the family gathers, the godmother forgets the baby’s name, a feast (“then there were dried beans and stewed pears and a gammon of bacon and magnificent loins of pork from three-hundredweight pigs, red and white and juicy”) is prepared and demolished. But then the grandfather is led to tell the horrible story that gives the book its title. It’s a deal-with-the-devil tale, a highly original one. A peasant village is dragooned into a series of pointless tasks for its feudal lord. A Green Man, with a red feather and a “little red beard” that crackles and sparks, offers to do the work for them, at the small price of an unbaptized child. Yes, Christine makes the deal with the devil, and later Christen helps defeat the Black Spider, and did I mention we began with a christening? A main subject of the short book is the strength of individual faith and the weakness of collective faith. As a group, the peasants are indecisive and paralyzed, while decisive individual actions both cause all of their troubles and save them. As with many of the tales associated with German Romanticism, the characters can appear flat, but only because the writers have a different approach to characterization. In these sorts of stories, the descriptions of the outside world tell us about the internal world. The Black Spider is sometimes extremely literal in this regard, as the above passage shows. The spider is almost symbolically too rich. 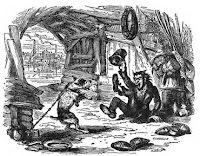 It is collective sin and punishment, the evil inside us all, but also, from Swiss folklore, a plague metaphor. And it’s also a vigorously described actual monster, with a sense of humor – it likes to perch on it’s victim's head, so everyone but its immediate prey can see it. I’ll reserve my complaints about the availability of 19th century German literature in English for tomorrow. The Black Spider ought to be, in the U.S. a creepy horror classic, at least. In print somewhere, at least. I read The Black Spider in a book of Three Eerie Tales. Here’s a fellow who read it in an old anthology with a fantastic Edward Gorey cover, well worth the click. It’s also been published on its own, with a boring cover, but scroll down a bit for a skin-crawling illustration. And here’s a discussion of what Robert Walser thought about The Black Spider (it “makes my back cold”). Now that’s an endorsement! Sometime, perhaps next fall, I hope to do a sort of Balzac roundup, so just a few comments on Ursule Mirouët (1841). A wealthy Parisian doctor has retired to his home town of Nemours to raise his orphaned great-niece, Ursule. The doctor’s cousins are legally entitled to most of his fortune, but they want all of it, and are worried that the doctor is like themselves, in other words, a greedy schemer who will try to cheat them out of every penny. The first crisis occurs when the relatives learn, to their horror, that the doctor, a long-time atheist, has been attending Mass. Chapter 6 is titled “A Brief Digression on Magnetism.” Oh no, more of Balzac’s pseudo-science. 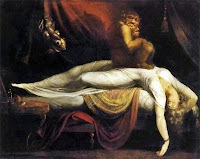 But in this book, the telepathy and far-seeing are as integral to the story as Balzac could make them, and the connections between religious spirituality and the “science” of the supernatural are a central theme of the book. To Balzac, the supernatural business is part of his realism. A modern reader may have to put a tiny bit more effort into suspending his disbelief. Once he does (once I did), the plot has a natural and satisfying logic. Ursule Mirouët is not as outrageous as Père Goriot, or as sublime as Eugénie Grandet, to which it has many resemblances (Balzac said Ursule was Eugénie’s happy sister, and he could be referring to either the characters or their books). It’s a delight. And it’s short. All of my favorite Balzac novels are short. We must be as precise as possible. Most novels and poems and essays are failures. Some are honest hackwork, some are the work of con artists, most are just the best the writer could do. Of the remaining books, most have value in the context of their time, but will eventually be forgotten. Nobody reads Nabokov or Fulmerford anymore. I don't spend much time with contemporary books. Most of my reading is amongst the tried and tested. The classics and the semi-classics. I like almost all of it. I appreciate the rest. My aversions* are few. On the one hand, it means I'm reading in the right places. On the other hand, it suggests a lack of independent judgment, an overdone respect for authority. What if I like everything because I am told I should? This is the side of Appreciationism that worries me. The more positive side: some humility in the face of history is a virtue. I have trouble with Stendhal. He's puzzling, he's difficult. Is the intelligent response to dismiss him as worthless? What, am I a bored 12 year old? So I focus my attention, I read some people who are smarter than me (critics, scholars), I slow down a little. I still don't like Stendhal, but I've gotten a much better sense of what he does, and why writers and readers have found it valuable. I sent out a distress signal regarding Hawthorne last year - just writing the post actually seemed to help in that case, helped me read more carefully. "Like" - there's part of the problem. I like a book, I don't like it. Who cares? As an Appreciationist, even I don't care. My curiosity about the variety and history of creativity is what I cultivate now, and I'm not sure that knowing what a book is and how it works doesn't sometimes provide almost as much pleasure as its actual contents. Appreciationism has a long history in English criticism. William Hazlitt is my model. One of his best essays is called "On the Pleasures of Hating," but open the Lectures on the English Poets (1818), or the Lectures on the English Comic Writers (1819, the man gave a lot of lectures) and see what he actually does. He describes a play, for example, reads a passage, and then says he thinks this line or that line is especially good, this character or that is especially well drawn. He points, and says "Look, isn't that good." This is not deep stuff. Charles Lamb is not so different. Neither is John Dryden. Neither is Dr. Johnson, Our Greatest Critic, a lot of the time - throughout The Lives of the Poets for example (the Preface to Shakespeare is more complicated). The criticism of Coleridge may be Appreciationist, or not. I don't understand a word of it. To push the tour of English criticism forward a little, Matthew Arnold and T. S. Eliot are definitely not Appreciationists. They don't just want to Understand, but to Interpret. I have enough trouble understanding. Thus ends Egomania Week at Wuthering Expectations. Next week, some actual books. * I love this word, common in Restoration comedies. "You mean to say you don't admire Sir Fopling Foppington?" "Fy, fy, he is my aversion." ** Here's a recent mention of appreciation, by a Spanish professor at the University of Kansas, which I may have entirely failed to understand, and which seems to identify it with "prescribing an attitude of silent awe." My impression is that Appreciationists are a noisy and enthusiastic bunch. Remember, we like everything! We'll talk your dang ear off. Silent awe! “Literary departments still labored under the impression that Stendhal, Galsworthy, Dreiser, and Mann were great writers." Great stuff. You can hear the whish of the rapier. One thing I would like to do on Wuthering Expectations is join in with this, deflating overinflated reputations, knocking the pretentious off their pillars, returning received ideas to their senders. Slash, slash. What fun. It will never happen. Almost never. "Know thyself," Socrates, or Heraclitus, or some be-togaed fellow, tells me. An ongoing process, but I know one thing. I'm not a Hatchet Man. I just don't have it in me. Constitutionally, intellectually, I am a softer, more pacific, creature, a respecter of authority, a reasonable re-rater of the overrated. I am: The Appreciationist. Tomorrow, an attack on, and defense of, Appreciationism. By quoting Epstein, Wood, and Nabokov, I am not endorsing their positions. I can appreciate both sides! Back to that James Wood interview for a minute, and "the essential juvenility of plot." He said it, not me! Wood immediately admits that he doesn't really mean it anyway, he's exaggerating for effect. Wood is not really making an argument here. He's just stating a preference, a preference for "fiction in which not a lot happens in obvious ways." It's a preference I share - give me Richardson over Fielding, Austen over Scott. Chekhov, Proust, Beckett. Give me Malone Dies (plot summary: Malone dies). There's a distinction I should make between story and incident. Everyone wants a strong story. It's the taste for incident that really matters. Clarissa has only three or four major incidents, that, over the course of 200 pages, might make for a taut thriller. Over the actual 2,000 or so pages, they become secondary. Or look at Proust - a fair part of "Combray" is devoted to details about how the narrator falls asleep, and the climax is when our young hero runs off to say farewell to his favorite hawthorn bush. * Dumas (or Hugo, or Dickens), fills his long books with much more incident. A lot more just happens, even if the basic story is not much more complex. The quote in the title is something meine Frau heard at a showing of the remake of Shaft. The dashes should be read as pauses, the inflection should be increasing - land hard on the last word. It's a brilliant piece of literary criticism. Incident is often mistaken for story, even by professional writers. A good action movie has a simple, possibly even mindless plot, but complicated episodes. Writers, like the Shafters, often get this wrong. We want fewer plot twists, but more cool incidents. The taste for incident is sometimes described as immature (action movies, video games). We're supposed to outgrow it, just as we're supposed to cultivate or somehow acquire a taste for sophistication in music. Honestly, is this anything but snobbery? The use of incident can be extremely subtle. Orlando Furioso is almost nothing but incidents, piled up to the moon, ingeniously woven together. Ovid's Metamorphoses works similarly - the fragments and stories are individually brilliant, but the transitions are marvels. My preferences are ceteris paribus. I prefer less to more, all else equal, but with the great writers, all else is never equal. Rabelais, Cervantes, Byron, Waugh - their wonderful books are bursting with activity. Now I don't know what to think. Maybe I like it all. Save that thought for tomorrow. Anyway, this has to influence how I write about stories. If I don't put a high value on story, then I won't be as thoughtful about revealing surprises as I perhaps should. Maybe writing this out will remind me to be more careful. Probably not. De gustibus non disputandum est. Nonsense, we dispute other people's tastes all the time. But how often do we argue with our own? * The most pathetic scene in all of literature? Marcel gives the hawthorn a big hug, tearing up his little suit and hat. What a great book. Although I have not read Jane Eyre, I know, through cultural osmosis, I guess, the entire story, including the last line* and the genuine “the ghost is actually a man in drag”-style plot twist. I know more about it than about any other major novel I haven’t read, except, possibly, David Copperfield (from a stage version at the Steppenwolf in Chicago) and Les Miserables (from the Jean-Paul Belmondo movie, the one set during World War II). Has Jane Eyre’s pleasure been spoiled for me – no, I reject spoiled, I know that - say, blemished, or even appreciably diminished? Does it matter? I have strong, strong doubts. Surely Charlotte Brontë is a good enough writer to direct my response to where she wants it. I want to note that Jane Eyre’s plot twist is the actual title** of one of the most read and assigned books of feminist criticism, so I cannot be entirely alone here. Dorothy W left a comment yesterday pointing out that there's an entire class of novels that have been so fully absorbed into the culture that a clean first reading is almost impossible: Dr. Jekyll and Mr. Hyde, Dracula, The War of the Worlds, A Christmas Carol. Almost any famous fairy tale. Frankenstein has to be just about the worst, or best, case. How many first-time readers miss the actual story on the page in front of them while looking around for Igor and the pitchfork-wielding peasants and "Puttin' on the Ritz"? Another example. The Hudson Review published, last fall, two first-rate excerpts from the Pevear and Volokhonsky War and Peace. One scene, one of the novel's half dozen greatest, involved the death of a major character. The assumption is that the magnificent details of Tolstoy's art override any objections. Still, they could have chosen a different scene. I didn’t mind revealing that Little Nell dies at the end of The Old Curiosity Shop. For one thing, Oscar Wilde’s comment on her death may at this point be more famous than the novel itself. (A typical response to Wilde is probably "Wait, which novel has Little Nell?" Or "Who is Little Nell?"). Second, Nell’s death is not really what one would call a plot twist. Any attentive reader can see it coming from at least the halfway point of the book. Dickens in fact received a steady flow of letters begging him to let Nell live. These were not necessarily the most sophisticated readers, and they understood the foreshadowing easily enough. Third, I don’t expect many of my readers to actually read the thing themselves, and those who do either aren’t reading for the story, which is not in and of itself worth the trouble. More on that tomorrow, maybe. And here’s the thing – I was affected by Nell’s death anyway, in spite of everything. Almost physically affected, with a little emotional jolt. The final scene is a materpiece of pace and tension. Our taste for the sentimental may not be what it once was, but Dickens knew what he was doing. I know I won't have the same response on a second reading - I'll be poking around to see how he did it - but it was not the "what" that was important. It was the "how". Who killed Roger Ackroyd? Who cares? That's another one I haven't read yet somehow know the twist. Still, I promise, I won't tell you. Unless I have a really good reason. * Update: first line of last chapter, not last line. My excuse: "Ignorance, madam, pure ignorance." Thanks to Imani. ** No, the title isn't Jane Eyre's Plot Twist. It's the plot twist of Jane Eyre. No, not The Plot Twist of Jane Eyre. Look, I'm trying not to give it away. I hate the word “spoilers”. It will never be used here without quotation marks. Stories – novels, movies, whatever – whose primary value is suspense exist, certainly. But is a story that is actually spoiled, ruined, by having heard it before really worth hearing in the first place? Maybe, but any book like that is unlikely to show up at Wuthering Expectations. So forget spoiled – let's try a more substantive point. I'll use James Wood to stake out an extreme case. In this interview, he claims to "make a point in my reviews of describing the entire book". He’s exaggerating – see his New Yorker review of the latest Richard Price novel, in which he covers a wide range of plot details, including what must be some key plot points, but actually leaves a lot back. Also, by the time most of us actually read the novel, we’ll (I'll) have forgotten almost everything Wood said. Our (my!) cognitive limitations are a separate issue, I guess. Prof. N. Reading made some comments on the Wood interview that got me thinking. Prof. Reading makes some serious arguments against Wood, using The Mill on the Floss, which has a plot twist, as an example. She mentions the value of rereading for depth, but I assume everyone agrees about that. More interesting are her ideas, some very classroom centered, about the value or experience of the first reading. This is not primarily about the value of shock or surprise, but the development of a certain freedom of expectation. If we know the end, or the turning points, our reading is directed towards them. This is a source of depth - we notice the details of how the author gets us where she's going - but at the price of a sense of contingency, a constriction of our imaginative freedom. Once we know what happened, we risk forgetting what might have happened. Let me return to the extreme case for a moment. Homer, Ovid, the authors of The Poem of the Cid and the Niebelungenlied, all assumed that their readers (listeners, viewers) knew a version of whatever story they were telling. The emotional power of Aristotle's classic catharsis was supposed to occur when the audience already knew the story well. Writers like Euripides, our first postmodernist, played off of this knowledge in plays like Helen and Orestes, creating outrageous, expectation-shattering twists, possibly at the expense of catharsis. But no matter how fundamental the story, there's always a first time, isn't there? At some point, likely, for most of us, long ago and completely forgotten, we had at least a brief moment when we feared that Abraham might really sacrifice his son. And if he did, that would mean ---. Then we got to the end of the story, and Isaac was alive, and the story meant this instead of that. But the possibility of that other meaning shadows the story. It is obviously impossible to write seriously about books without describing what's in them, in detail - it's the details that matter. Otherwise, we could just read encyclopedia entries. I have to draw the line somewhere. Orestes kills his mother, and is tormented by the Furies. Moses dies without ever seeing the Promised Land. Robinson Crusoe gets off the island, eventually. And Jane Eyre - well, that would be telling. Tomorrow, I'll see how, if, when, I can tell. * Not on Google – I can’t be the first, can I? Anyway, I am, for the moment, so proud of this bon mot that I want to copyright it. Must credit Amateur Reader. Anything else I write, who cares, copy away. Unless you’re a student working on a paper in which case, a) your teacher can tell when it's not your own writing and has Google, and b) show some dignity, man. ** I'm taking the argument seriously enough that I have skipped Blogging the Canon's posts about The Mill on the Floss, in order to preserve the surprise. Based on these five poems, Channing seems, to me, competent and dull. He has a poem called "Walden" that Thoreauviasts will find interesting for its subject. Hope's child, I summon infiniter powers. In this case, Poe can't resist going for the joke, and I don't blame him. And thus one side of Heaven anoints. Poe's book reviews will be of value to anyone who grumps that only the frauds and fools get the attention, while the worthies are ignored. Yes and no, and it was always so. * And look, there are four poems by poor William Gilmore Simms, the novelist who did not quite make the cut. I have no idea how John Hollander picked these poems. Does he like them? Are they representative of something? I don't want to give the wrong idea about Poe the book reviewer. He viewed his brutal negative reviews as a necessary enterprise, as important as identifying what was good. He also did plenty of the latter. Poe was an early enthusiast for Hawthorne - if Poe had been intellectually weaker, he might have seen Hawthorne as a competitor. The best poets of the day - Longfellow, Tennyson, Lowell, Bryant - received detailed, serious criticism from Poe. Dickens was treated as a sort of magical force of nature, almost beyond criticism. At least one novel, Robert Bird's Sheppard Lee, has recently been returned to print by The New York Review of Books in part on the strength of Poe's recommendation. Sheppard Lee does sound pretty good. Poe's commendations have a touch of the back of the hand, don't they? (For another example, regarding Cooper, see here). That aside, notice the accuracy of Poe's judgment. Hawthorne, Cooper, Brockden Brown - that's our early American canon of fiction writers, almost. Just replace Simms - poor Simms, not quite good enough! - with Edgar Allan Poe. By 1845, Poe had become a famous writer, for "The Raven" and for a number of his stories, the same ones that are well-known now. He took the opportunity to review his own new volume of Tales. Let's see what he thinks of himself. "The Mystery of Marie Roget", we are told, should help solve an actual crime in New York City. And that as good as Tales is, it does not even contain much of Poe's best work. Is this all an elaborate joke - I mean, were readers in on it? I have no idea. There's a digressive paragraph atacking the editor who rejected "The Tell-Tale Heart" - is this a wink at readers, or genuine revenge? * Anonymous reviews can be highly professional - see Virginia Woolf's critical essays, for example. Commenter "comments i done left" asked a reasonable question about Poe's book reviews yesterday - is it all this good? Meaning, funny and vicious. No. The Library of America edition of Essays and Reviews runs to almost 1,500 pages. I've read maybe 40% of it. I see (so far) three good reasons to read around in it. First, as with any selection of magazine writing, the book gives a picture of the intellectual landscape that is unavailable in more standard literary histories. We get reviews of the Keats-derived Orion by R. H. Horne, the historical novels and essays of Edward Lytton Bulwer*, The Coming of the Mammoth by Henry B. Hirst, and The Swiss Heiress by Susan Rigby Morgan, as well as reviews of Longfellow, Cooper, Dickens, and, oddly, Poe. Neither I, nor you, nor anyone else wants to read that first list of books. But they were there, and Poe, savage or appreciative, is a good guide. Second, Poe uses the reviews to address more serious issues of taste, form, and criticism. The purpose of poetry, the purpose of book reviewing, grammar and prosody, the art of the novel, the creation of a national literature. It would be an exaggeration to say that Poe was the only person in America taking these things seriously (see Emerson and Fuller over at The Dial**, for example) but not an enormous exaggeration. And Wilmer, a satirical poet, is actually a friend of Poe's! There's no shortage of books today to which very similar words could be applied. Yes, there's more of this. Much, much more. * No idea why the Library of America, or Poe, or whoever, calls him Lytton Bulwer rather than Bulwer-Lytton. ** Poe, unlike the Dial writers, is interested in actual books, ugly or otherwise. The Dial is where the theorists lived. I know who I'd rather read. Edgar Allan Poe made his living as a book reviewer and magazine writer. He was a pioneer, one of the first people to take book reviewing seriously. The rest of the week: more of the marvels of Edgar Allan Poe, hatchet man. Every page reference is to Essays and Reviews, Library of America, a valuable book. The minor characters of Dickens are almost always as vigourous as anyone else's full-rounded major characters. It takes so little, in the right hands, to breathe life into a fictional character - the right gesture, the right phrase. Quilp the dwarf has an unnamed errand boy with two characteristics: he is the only person who can talk back to Quilp with impunity, and he walks on his hands at every opportunity. Is he a one-dimensional character, or does this count as two dimensions? Regardless, in the novel, in the imagination, he lives. I doubt many Dickens readers would agree today - as I argued earlier, the taste for sentiment has probably receded too far. Even among the early novels, most would now prefer the more clear-eyed Pickwick Papers, or more unified Oliver Twist. We also have some idea of the masterpieces to come, which must affect our judgment. The Old Curiosiy Shop was published in weekly installments. 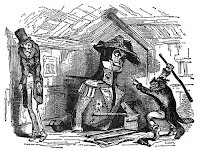 The first stage adaptation appeared almost immediately, not only before the story had ended, but almost before it had begun - before, as an example, Dickens had even introduced the villain, Quilp. So the contemporary reader, after enjoying the latest installment of the novel, could then go to the theater to see a completely different story (I think a sort of drawing room mystery) with the same title and two or three of the same characters. The play was popular and ran the length of the serialization of the novel. At some point, it was rewritten to arbitrarily insert more of the characters from the novel, but the story was never changed. Very strange. Dickens' own performance of the end of the novel was one of his showstoppers when he did public readings. The audience, weeping and sobbing, would get an hour of The Death of Little Nell, followed by a seventy minute Christmas Carol, to cheer them up. The Old Curiosity Shop has a villain, a dwarf named Quilp. There have been more effective villains in the history of literature. His villainy consists of cruelly but legally foreclosing on a debt, and framing a teenage boy for robbery. Minor stuff, hardly enough to fill the day. “As it was, the dwarf remained upon his back in perfect safety, taunting the dog with hideous faces, and triumphing over him in his inability to advance another inch, though there were not a couple of feet between them. I am generally shy of criticizing the pleasures of others, but this seems like thin entertainment for a real villain. What does it mean? Maybe nothing. Who cares, I've never seen anything else like it. Note to skimmers, i.e., rational blog readers: Every quotation I’ve extricated from The Old Curiosity Shop here is meant to be enjoyable. 'It's a stew of tripe,' said the landlord smacking his lips, 'and cow-heel,' smacking them again, 'and bacon,' smacking them once more, 'and steak,' smacking them for the fourth time, 'and peas, cauliflowers, new potatoes, and sparrow-grass, all working up together in one delicious gravy.' Having come to the climax, he smacked his lips a great many times, and taking a long hearty sniff of the fragrance that was hovering about, put on the cover again with the air of one whose toils on earth were over. 'At what time will it be ready?' asked Mr Codlin faintly. Mr. Codlin has an extremely minor function in the plot of The Old Curiosity Shop. The landlord has none whatsoever. Nor does the stew. As far as the story is concerned, the whole passage could be cut, by, say, an editor with no taste or sense. May I insert another note to skimmers, this time skimmers of Dickens? Slow down! Every Dickens novel is a storehouse of treasures like this. Don't leave them behind.